One highly effective way to create a world is to start by creating a character that embodies the core idea of that world and then use them to serve as the entry point into that world. I still haven't played Red Dead Redemption but from what I know the character of John Marston is a good example of this. He's somebody trying figure out his position in a changing world while struggling to distance himself from a troubled past. That sound like a fairly accurate description of the "wild west" in the early twentieth century. This personification doesn't event need to be the player character; in the case of BioShock it's clearly Andrew Ryan. 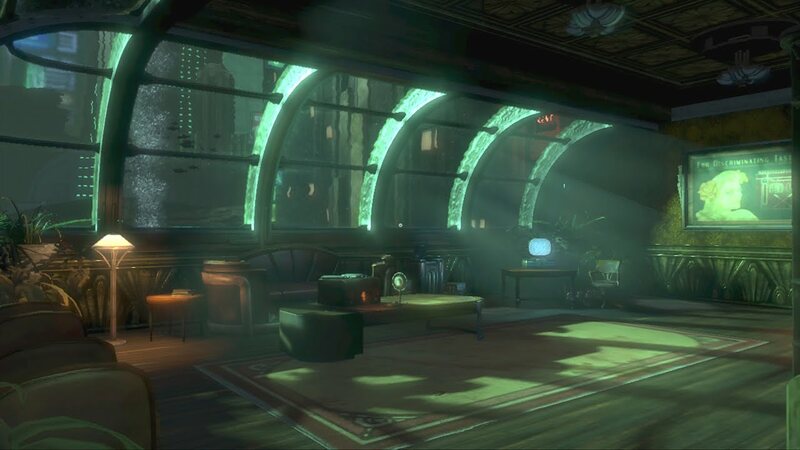 Would our experience of BioShock, our understanding of how far it has fallen, be as powerful without having first been exposed to the ideal of it by Ryan himself? Good to hear from you! I hadn't thought too carefully about the character-centric technique for world building. After considering your examples, I'm thinking that maybe a non-player character is actually more suited to doing this than a player character. Characters like Andrew Ryan, GlaDOS, and Alyx can never do anything outside of their proscribed role whereas I can make Marston act like someone completely different than the person I hear reciting dialogue in the cutscenes. Thank you Jorge and Scott for another thoughtful podcast. I sat and thought long and hard after listening about gaming and the worlds I spend so much time in. I think what makes a virtual world wonderful, memorable and replayable to me, is if I feel that whoever created it, cared enough for me to care too. What substantiates a virtual world experience for me is not only the obvious visual aspects but underlying nuances developers embed creating a feeling of realism. Be it a fantasy or realisticly styled world. From changing light and shadows, weather and sky to subtle sounds and movement. It is so important that these subtleties change wherever I am. I always look up and see what is above my head, even in buildings and Dragon Age never failed to deliver. Fire, dialects, wind and night sounds in Far Cry had me smelling the dust of Africa, where I was born and lived most of my life. An incredible world beautifully done, it felt like they paid homage to my homeland. Pity about the story! The creaks, bumps and falling debris and collapsing injured in ME2, the atmosphere is so real and tangible. What also creates a world for me is emotions, and interactions. Helping, saving, making a difference, this also transports me to another level of reality and builds on the screen experience. Though Fable 2 felt like an RPG with training wheels, I loved the variety of environments created, varying where you travel to and the enemies you encountered changed along with that. Oblivion gives me a sense of freedom and expanse that I have never felt in any other game, that alone is what appeals to me returing to the game repeatedly. Borderlands has a sense of what it's like to live in a comic drawn world. It is about the humour and quirky posters, quips and the ridiculous land of Pandora as much as the greatness of the co-op aspect which expands the uniqueness of that world to another persons companionship and shared experience. Folklore charmed me with the imagination and beauty of depth of ocean, tragedy of war and whimsical fantasy, from envionment to characters and creatures. Sometimes I find myself sitting in front of a game and being so moved by the thought involved in a single corner of a scene, that I wish I could say to the team of wonderful, brilliant and creative people behind the scenes, a heartfelt "thank you". I do write to them sometimes! I'm new to console gaming (only been playing for 3 years) and I have sat and been utterly blown away by the experiences and emotions I've felt. Even movies feel a little hollow nowadays. I wish gaming could do more for the real world and make as much of a difference. It seems so insular, detached and exclusive. I am always amazed that the gaming community are not reached out to when world disasters happen and have looked for online donatations on XBox Live, or on the PS3. It seems strange to me that our virtual worlds where we spend so much time fighting evil and hardship do not ripple out to the realism of human suffering. But ... that is another subject, and a tricky one. Thanks for your great posts and podcasts. I couldn't resist a comment about worlds in videogames, given my recently formed interest and love of how games use their spaces to create everything from atmosphere to awe, as well as in how they are built. I think one of (if not) the best things this generation will go down in history for is the evolution of game spaces and just how effective they have become. From Oblivion up to games we haven't even seen yet (The Last Guardian, BioShock: Infinite), the spaces in which we interact have come such a long way and I can't help but reflect on all the cool places I have been these last few years. Sure, the last generation (and even the ones before those) managed to create convincing, imaginative worlds that we could get immersed in, but I really believe that this generation is on a whole other level. It's a shame though: ever since reaching such highs, gamers in general have gotten used to them and as such, expect them in future games or at the very least take what they do get for granted. It's easy to look at Rapture (something I do too much, perhaps?) or Liberty City, or the Wastelands of Fallout 3 and say that they are our best examples of fantastic spaces, but I'm willing to say that games like Heavy Rain, Alan Wake and Mirror's Edge also provided some really intriguing, really compelling places for us to explore, enjoy (with our actions) and, most importantly, be in. The games themselves may be flawed, the spaces they use may also have some issues, but in general terms I think even they are good examples of just how far world building has come in recent years. I'll be looking at some of this myself in the near future so that's enough thinking about it for now. I will say this though: Super Mario Galaxy (and I assume its sequel) is a great example of a Mario game remaining a Mario game despite not taking place in the Mushroom Kingdom. Obviously, by using familiar characters, locations and music -- among others -- it still feels like a Mario game, but it's definitely worth thinking about given its change of location and style. Thanks for stopping by and for such beautifully-written sentiments! Like you, I am continually amazed by the amount of human effort that goes into creating games. It's crazy to think that (in most games) every single piece of the world was crafted and put in place by human hands. Hopefully as time goes on, games will grow out of their insular state of existence. Progress is slow, but the indie and "serious" games movements show a lot of promise, as do certain mainstream developers and creators like Bioware and Ken Levine. Intriguing thought on how this console generation will be remembered as the "world-building" era. I never thought of it that way, but I think you're on to something. The emphasis on creating a sense of "place" is evident in everything from PixelJunk Eden to Batman: Arkham Asylum. I think Mario is a great example of how a game's systems and mechanics define its world. The way movement works in Mario is just as important as the environment itself. Looking forward to that post!